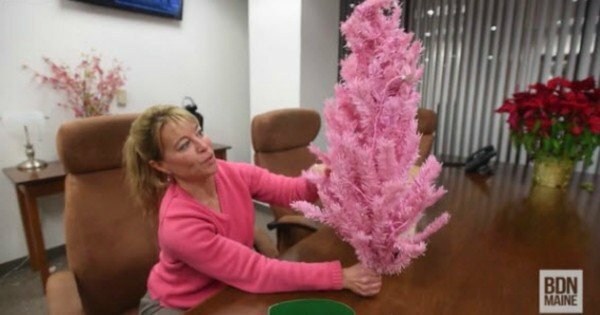 "I am very sad": A teacher has been told to take down her pink Christmas tree. 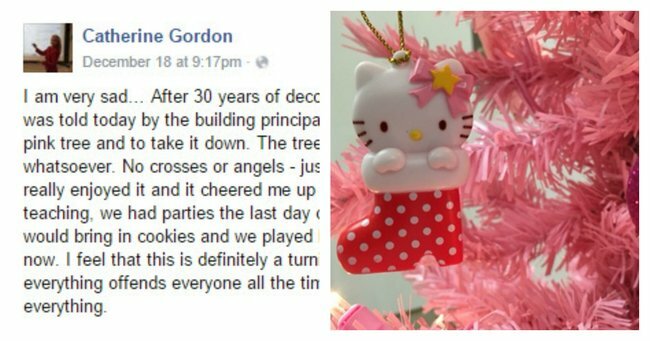 A Christmas controversy has erupted in a high school in Maine after the principal ordered a long-serving maths teacher to remove her pink Hello Kitty Christmas tree. 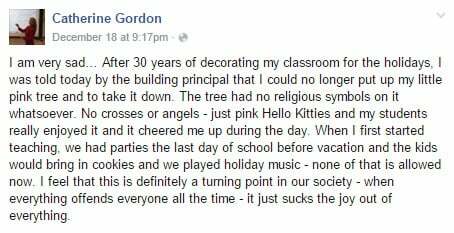 Catherine Gordon aired her anger on Facebook, complaining about the order from on high despite the fact she has been decorating her classroom for 30 years. “The tree had no religious symbols on it whatsoever. No crosses or angels — just pink Hello Kitties and my students really enjoyed it and it cheered me up during the day,” she wrote. A teary Ms Gordon told a local news station that the principal had thought the tree “favoured one religion over another and that it was not appropriate”. The teacher said once upon a time she celebrated with her class with a big, green Christmas tree and a holiday party. “I understand that the administration is in a very difficult position. No matter what they do, someone is going to complain and I think that they do the best they can, but it just seems that in our quest to be tolerant of everything, we’ve become intolerant of everything,” Ms Gordon said. The offending tree (minus the Hello Kitty decorations). Screenshot via BDN Maine. Bangor Daily News reports that the school issued a statement saying it educated students about cultural traditions and holidays through “curriculum ties” and was focussed on academic excellence. “Our focus is educating students to become global citizens with the necessary 21st century skills for college and career readiness for their future success,” the statement read. And clearly that doesn’t involve Hello Kitty.